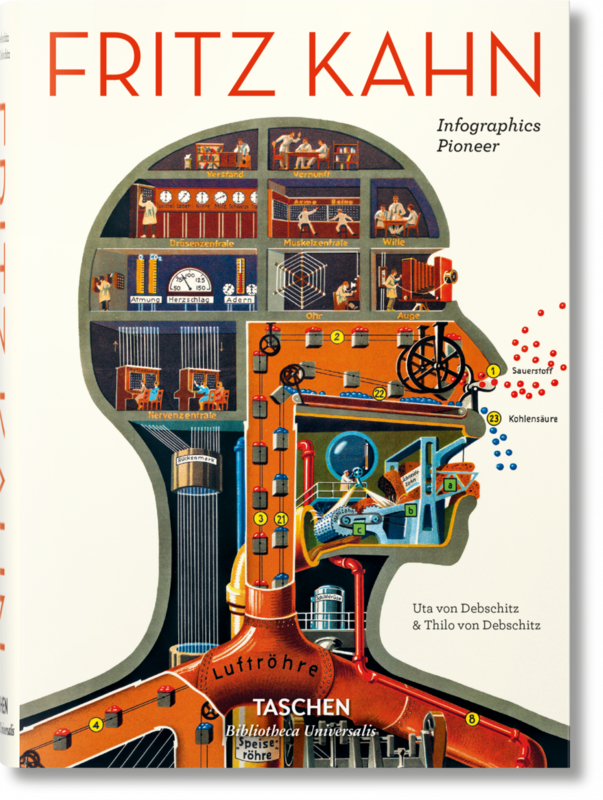 Since the world’s first monograph on Fritz Kahn (Fritz Kahn – Man Machine, SpringerWienNewYork 2009) has been out of stock for some time, the siblings Uta and Thilo von Debschitz have released a fully enhanced new edition. 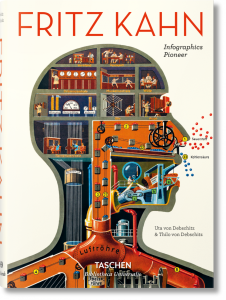 The coffee-table book “FRITZ KAHN” (Taschen, 2013) provided an even deeper insight into the creative work of the popular science author: more than 350 images on 392 pages invited readers to form their own ideas of Fritz Kahn and his multi-faceted œuvre. This book is out of stock as well. In July of 2017, a new edition with 526 pages was published in the Biblioteca Universalis – a selection of favourite titles from the Taschen publishing house. The book’s core is a comprehensive image section with more than 280 illustrations in twenty chapters, following Fritz Kahn’s own systematics. It presents a selection of the most interesting images from Kahn’s complete works and several preserved original illustrations. Visual analogies and metaphors as well as aesthetically or topically fascinating works take center stage. To emphasize their expressiveness and hint affinities between the images, the illustrations have been taken out of their context and newly assorted as a kind of portfolio. Most images have been reproduced at a much larger scale and thus may give a slight idea of the visually overwhelming impact Kahn’s richly illustrated books triggered in his first readers. Detailed captions shed light on the content of the images as well as on Kahn’s ideas and the general mindset of his time. The figurative language and stylistic variety of his magazine articles reveal that Kahn taught his eager audience in a very entertaining way. The monograph presents three programmatic texts as transcriptions and original spreads of various illustrated articles from the 1920s to 1940s. Kahn’s work is framed by a foreword by design historian and journalist Steven Heller (New York), an introduction to Kahn’s professional career and work methods as well as biographical and bibliographical background information. Thus, the monograph presents an overview on Kahn’s creative oeuvre, which still inspires through exceptional variety and vividness. It started 30 years ago: Having finished high school, Uta von Debschitz planned a three-month tour through the United States. An Israeli friend of her mother put her in contact with a middle-aged couple in Brooklyn (Emanuel and Shoshana Kahn), where she stayed for two weeks. About 10 years later, when her brother Thilo von Debschitz was an intern at a design agency in New York City, he visited the Kahns as well, and the families maintained a cordial friendship ever since. From Emanuel’s brief description, Uta and Thilo learned only a few details about his personal history: that he was raised in Berlin, brought out of Germany by his father Fritz after Hitler’s takeover, and later emigrated with his parents to Palestine. The years passed, and Thilo became a founding partner of a design studio in Wiesbaden. One day in early 2008, a client gave Thilo a Rumanian design magazine printed on the client’s paper stock. As he casually browsed through the pages, Thilo spotted four fascinating depictions of the human body from the 1920s – and stopped short when he read the credit line: “Fritz Kahn (1888-1968)”. Could this be Emanuel’s father? Thilo sent the images to Uta who at the time worked as an editor for a popular-science publication. When she saw the Kahn illustrations, her immediate reaction was: “If there are more illustrations like these, let’s make a book about it!” Fritz Kahn was indeed Emanuel’s father, but he left his family early, so Emanuel knew very little about his father’s work, and he was not interested in learning more. Since neither family members nor historians knew very much about Fritz Kahn, and since there were just a few Kahn images available on the world wide web, Uta and Thilo started an intense search for traces: They looked for books by Fritz Kahn in antique bookstores, studied his estate in European and U.S. archives, discovered contemporary witnesses, and reconstructed Kahn’s biography. During that process, they met designers and academics who were also interested in the work of Fritz Kahn from various perspectives. These research results began to pique Emanuel’s curiosity, and he supported the siblings with an extensive license to reproduce his father’s images. Soon, the book idea became reality. The von Debschitz siblings conceived a bilingual coffee-table book to give a broad audience access to the illustrations of Fritz Kahn. 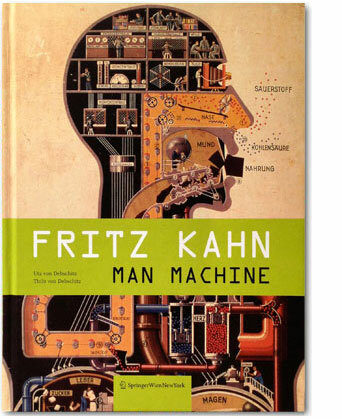 They signed a contract with SpringerWienNewYork, a publishing house focusing on architecture and design, and in 2009, Fritz Kahn – Man Machine / Maschine Mensch was published to enthusiastic reviews in Europe and the US. The first edition sold out in 2.5 years. But international interest in Kahn’s work continued to grow, Uta began a doctoral thesis about his visualizations, and both siblings discovered further illustrations and documents. And now an expanded, completely revised, trilingual reissue has been published.